Yes, it is true, in the hottest days of summer it is difficult without air con, but still the house is powered by solar panels and is not ready yet for air con... We are working forward to get there in the near future! Technology is near to give us tools to have AC also in off grid houses! "formentera is just a beautiful place - many different options for swimming, going out or just rest. our landlord, stefano, picked us up from the port and offered a lot of his time to bring us to the scooter rental etc. the house is very nice, typical hippie-style with a touch of family house, nice decorations and really a lot of space. everything in the house worked properly. Stefano lives next door and was always pleased to help us with any request. free wireless in the house, bed linen changing after one week and also the possibility to get clothes etc. washed. the people in formentera are very friendly, shopping possibilities nearly on every corner. regular fairys to other island like ibiza etc. beaches are all around formentera, from the house the nearest beach is about 10 minutes on the scooter. for scooter rental we would recommend COOLTRA, they gave a excellent service to us incl. great price for 2 weeks. we had a fantastic time and recommend Stefano and his house to everyone who is interested!" Ein wunderschöner und zauberhafter Ort! 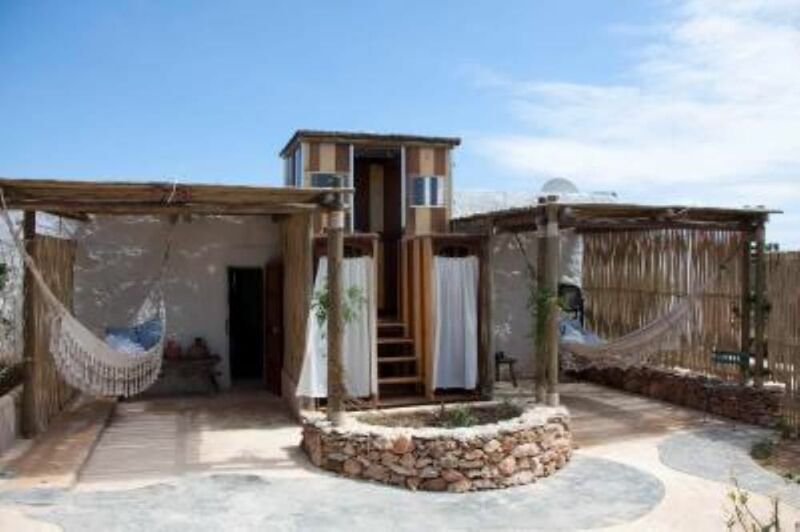 Das Haus ist einerseits ursprünglich, aber auch schön eingerichtet und erinnert an die Hippiezeit auf Formentera. Das Haus ist ungewöhnlich aber schön eingerichtet. Auf den zwei Terrassen ist es gemütlich. Die Moskitonetze sind Gold wert. Stefano ist ein sehr netter und hilfsbereiter Gastgeber. Lediglich mit dem Wasser gab es an einem Tag Probleme, aber Stefano und seine Schwester haben sich sofort darum gekümmert. This is the second time we have stayed at Stefano's house, and we couldn't believe it is now even better! There is so much space to enjoy and the place is big enough to have several couples staying and still have your own space. Stefano and his wife were as welcoming and friendly as always, it is like a home from home. The villa is in a great location from which to explore the whole island. You also want to spend the odd evening at the house itself, playing music, listening to the crickets, smelling the herb-scented air and enjoying a bottle of wine with your people. I cannot recommend this place highly enough, it is simply paradise. We will be coming back again! La maison est tout à fait conforme aux photos. Elle est très agréable avec ses différentes terrasses qui permettent de profiter de l'ombre ou du soleil à chaque moment de la journée. Les chambres sont jolies et pas trop impersonnelles ce qui est agréable pour ce type de location de vacances. Stéfano est très gentil et extrêmement serviable et fait tout pour que votre séjour se passe bien. La maison est située à quelques km de Sant Francesco, dans un endroit calme. Comme l’île est petite, tout est à côté et il y a même un petit supermarché bien achalandé à seulement 2 km. Bref, n'hésitez pas à louer se petit havre de paix pour vous ressourcer ! inquilinos perfectos, amables y disponibles, puntuales y limpios, muy recomendables!!! we can organize breakfast,dinner or supper!! !